316L Surgical Steel Barbell with Epoxy Flame Skull Head. 14G 5/8" Flexi Peace Sign Tongue Ring.FLEXI PEACE SIGN TONGUE BARBELLS IN COLORS SHOWN BELOW.TOP QUALITY FLEXIBLE ACRYLIC.14 GAUGE 5/8" (16MM) LENGTH SHAFT Flexi Star Tongue Ring. FLEXIBLE SHAFT U.V. 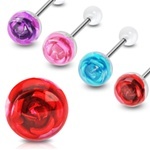 STAR TONGUE BARBELLS IN COLORS SHOWN BELOW INCLUDING PINK,RED,PURPLE,BLACK,DARK BLUE,WHITE AND FLOURESCENT GREEN/YELLOW.TOP QUALITY 14 GAUGE 5/8" (16MM) LENGTH SHAFT.